It's the 30th of December and I am flying India bound. With a stop in the Middle East for refuelling, a stop at Delhi to let some people off, we arrive at Bombay Airport some twelve hours or so later. It will now be a few hours wait and another flight of around three hours to the Southern State of Kerala where my final destination will be. Allowing for some time differences it is now the 31st of December so I will be welcoming the New Year in, in India (in fact as it turns out I will welcome it in in an Inn in India). By the time of the flight it is daylight and I am able to see down below us where the gentle curves of the palm green Keralan coast meets the deep blue of the Indian Ocean, (this land used to be Tropical Rain forest). During the change of flights I had met another English couple who were heading the same way so we decided to share a hotel together for the night. Using the 'Traveller's Survival Kit to India’ guidebook, one is found and we ask the driver of the auto-rickshaw (a sort of motor scooter with three wheels and a seat for two or three) to take us there. I knew from a previous visit to India that it is always best to agree a price first and also that they will rarely take you to the hotel which you ask for - it will always be another where they can get a cut/commission from the owner. They will tell you that the one you want is no good, burnt down, insect infested or any of a hundred other reasons for not going there, however, if you are insistent and persistent enough then you will eventually get the one you want. The one we arrived at was ran by someone called George who had spent some time working in England so could speak good English, was extremely helpful and friendly and kept a reasonably clean although quite basic guest house with rooms at around £1.50 per night. It was the night of New Years Eve and a small group of locals gathered at the tables in front of the guesthouse to drink, sing and eat. They made it clear that I was welcome to join them which I did for a little while during which they were quite keen that I shared in their drinks and singing. In the end sleep was necessary for me whilst the singing continued down below. 1st of January 1994 and there is one final leg to my journey which is 150 miles overland - I decided that a train is best bet for this distance and seem to find the right one relatively easily although the supposed 3 hour journey is really 5 hours plus. Arrival - Alwaye - a smallish town in Kerala, which rarely sees a white face (that is until now when there will be thirty to forty in town). Purpose - to study some of the 'performing arts' of India. Coming for this purpose are people from Europe along with some from India, to study subjects including - Indian theatre, visual arts, vocal work, yoga and various forms of traditional dance. I will be specialising in two areas. 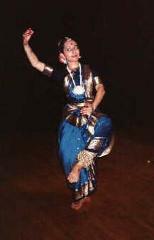 Firstly there is Kalari, which is the traditional martial art of southern India, and then secondly Indian drumming and percussion. The course is fairly intensive and each day follows a similar schedule, which includes two hours of Kalari before breakfast, about four hours of drumming in the day, some time for collaborative sessions with people working in different areas, and an evening performance by a professional company. Weekends are free to travel and explore, or to take it easy. For the first week two hours a day Kalari is quite enough - in fact all the aches and pains made it increasingly hard to walk let alone jump about, as the system requires. Most of the other people doing the Kalari were dancers and it was reassuring to know that they were finding it just as hard. However, by the second week, muscles were easing up and I was able to start putting in time for extra practice. Kalari, or Kalarippayattu to use its full title, can be literally translated as 'training for the battlefield'. Its history goes back to distant times and its practice is mainly confined to the villages and towns of Southern India and Kerala in particular. The training is done bare footed on the bare earth in the early mornings. Although outside, the training space is aligned with the cardinal directions, having its entrance in the east, which being where the sun rises represents birth. Upon entering, it is considered auspicious to enter with right foot first and touch the ground with the right hand to acknowledge the Earth Mother; this hand then touches the brow centre to acknowledge the gods that impart wisdom. Next both knees are touched to honour Hanuman the Monkey God, the God of Strength. Touching the shoulders to honour Garuda the Eagle God, the God of Life, follows this. The ritual continues by walking round the training area in a clockwise direction following the path of the sun through our sky; paying respects at a seven tiered alter in the south west corner and then after completing the circuit the training begins. Our training comprised of vigorous warm ups, practice of individual techniques and movements which were then put together into sequences called 'meipayyatts' which means 'training for the body' (these are Patterns, Forms, Kata). At the end of each session just as you thought you could do no more and the sun was coming up fast would be the time that the really hard and strenuous exercises were introduced!! The first two weeks we concentrated on open hand work and then we were introduced to a two-person staff form and to some short stick. 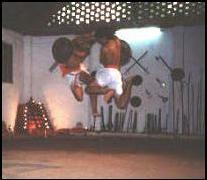 Kalari has probably one of the greatest varieties of weapons of any martial art and these are mainly hand made. Our teachers were the two sons and one senior student of the Master - Master Vasudevan Gurrukal who was featured in the BBC series' 'The Way of the Warrior'. Vasudevan Gurrukal himself is now in his sixties but still training regularly as I found out when I visited his home village one weekend to stay at his house and do some training. 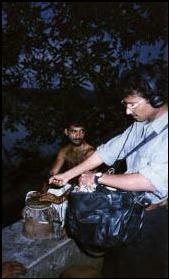 He is also a doctor/practitioner of Ayurvedic Medicine. During a guided tour of his garden he showed me the herbs, which he uses to make remedies, the recipes of which have been passed down through the family for generations. These are written on palm leaf manuscripts as is much information relating to the philosophy and practice of Kalarippayattu. In addition to our training we also received a week of daily sessions in Ayurvedic Massage, which is given with specially prepared oils and the practitioner using his or her feet to apply the massage whilst using a rope suspended across the room to help keep balance and regulate the pressure. For the drumming sessions a special bamboo hut was constructed down on the banks of the 30 metres wide, slowly flowing river, which we also occasionally used for swimming. This prevented our sound from disturbing others too much. Ours was a small group, just four of us learning from the Drum Master Assam who is afforded the status of a guru by his students. One session a day was spent sitting on sawn off tree trunks and using hand sticks to beat out our rhythms on another tree trunk. This is an excellent way to learn as the solid wood gives a clear and precise sound. Another session was spent playing the South Indian chenda drums, which we were greatly privileged to do as traditionally students play for 6 months on the tree trunks before being allowed to play the chenda drums. 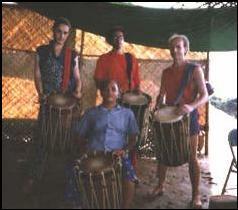 To learn the rhythms by ear, it is first necessary to speak or sing the drum language. There is an adage that says: ‘if you can say it, you can play it’. Each session started and finished with a rhythm that is devoted to Ganesha, the Elephant God who is considered the ‘Lord of Beginnings’ and the ‘Remover of Obstacles’ and is generally invoked upon commencing any new venture. Most weekday evenings we were visited by groups performing such arts as: Kathakali theatre, Bharathanatyam dance, singing, drumming and folk music and dance. This full schedule often meant that it was midnight before returning home, with the prospect of another early start the next morning. By the end of the month, all the various groups were preparing end of course performances or demonstrations. Our drum group opened the evening with our percussive contribution. This was performed on a punt type boat that was illuminated by oil lamps and guided across the river towards the audience who stood or sat by the riverside. 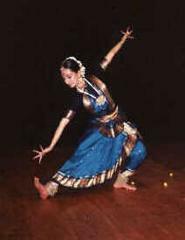 From the Kalari practitioners, a group of six of us developed a performance piece based on myth, music and martial movement which fused together many links between the areas of dance, rhythm and martial arts, whilst touching on the mythological and metaphysical aspects of the arts. Over the lively and intensive months workshops I was inspired by the cross-fertilisation of the various disciplines, the dynamic interplay of the traditional and the contemporary and the meeting of eastern and western ideas. The visit also provided the opportunity to experience some of the myriad sights, sounds and smells of Southern Indian life, the interesting array of food and drink, the different way of looking at life which each culture has, and the freedom to travel. 1st February - the train leaves Alwaye bound south - this time I travel with some friends made on the course, a few of us spend a day or two by the beach at Kovlam (to chill out), some are staying in India longer to travel - I must now leave. As the plane clings to the coastline I take a final look at the luscious greenery and abundant rivers and breakwaters of Kerala, gradually the terrain changes until we touch down in Bombay, whose airport is surrounded right to the perimeter fence by a maze of mile upon mile of shanty town built out of scrap material. A short visit to Bombay and then it is time to leave behind this land of incredible diversity - time to return to Britain and new adventures.